CREATINE SUPPORTS A VARIETY OF HEALTH AND FITNESS GOALS! You don’t have to be a bodybuilder or competitive athlete to benefit from supplementing with a creatine supplement. While creatine supplements are used primarily by athletes training for explosive type competitions such as bodybuilding, it can be useful as a supplement for general health as well. Energy production and more... We have explained how creatine combines with ATP in our body to produce energy. There are a number of health issues where supplementing with creatine may assist with your recovery. It’s also showing promise in preventing some diseases you may be genetically pre-disposed for such as high cholesterol and neuromuscular afflictions. Gain Weight – Energy and hydration for your muscle tissue Being energized during your workout directly translates to more muscle mass as you will be able to train harder and longer. A creatine supplement is a must for this purpose. Creatine not only assists with muscle development through effective training, it can help increase the size and mass of all your body’s muscles by maintaining proper hydration in your muscle tissue. Water gets attracted to the creatine phosphate in your muscle cells making them bigger and fuller. This has the added benefit of keeping your body in positive nitrogen balance which is "muscle building", according to some recent studies. Energy – ATP is a rapidly depleted energy source. Creatine is the key to more production Creatine is directly related to adenosine triphosphate, forming the ATP-CP energy system. ATP is formed mitochondria, the power plant for energy your body. ATP has been referred to as the "universal energy molecule" used by every cell in our bodies. Improving the body’s ability to generate and use ATP for instant energy when you need it comes from supplementing with our Creatine Ethyl Ester supplement. Active Lifestyle – Our Creatine Ethyl Ester has a long list of benefits for overall health Increasing oxidative stress, along with the cell's inability to produce essential energy molecules such as ATP, is a marker from aging cells found in many disease states. Research indicates keeping high ATP levels are essential in fighting the aging process. Of all the nutritional supplements, ProteinCo Canada’s Creatine Ethyl Ester appears to be the most effective for maintaining or raising ATP levels in the body. Other research has shown that creatine may have a wide variety of uses. In fact, creatine is being studied as a supplement that may help with diseases affecting the neuromuscular system, such as muscular dystrophy (MD). Recent studies suggest creatine has possible therapeutic applications in aging populations for wasting syndromes, muscle atrophy, fatigue, gyrate atrophy, Parkinson's disease, and Huntington's disease. Several studies have shown creatine can reduce cholesterol by as much as 15%. Some studies have found that creatine may also increase growth hormone production (HGH), which is crucial for being able to remain active at an older age. ProteinCo Canada’s Creatine Ethyl Ester HCL is a step ahead in the world of supplements Canada when it comes to creatine absorption. With this ethyl ester from creatine, the molecules are easily transported through lipidic (fat) intestine and muscle membranes promoting greater absorption. The absorption rate is superior to any other form of creatine. THE BEST CREATINE WHEN IT COMES TO FAST ABSORPTION! Possibly superior to creatine monohydrate If you are having good results with our Creatine Monohydrate, you don’t necessarily need Creatine Ethyl Ester. There is a chance it would work better for you however, so it might be something you want to try at least once. We have a 40 day money back guarantee so you really have nothing to lose. The reason we offer two creatine supplements is one may work better for some while the other works better for others. Each person is different so our goal is to offer some choices when able to let you experiment and find the ideal creatine supplement for you personally. Most research indicates Creatine Ethyle Ester absorbs faster and may be a superior form of creatine for many. Creatine Ethyl Ester and nothing else Protein Co specifically formulated Creatine Ethyl Ester to be a stand-alone product. When you are looking for the specific advantages creatine offers, this should be a product on your supplement shelf. You get the best creatine ethyl ester that is pure and of superior quality. Take you training up a notch when you use this powerful supplement on a regular basis. Q – Why do I need to take so many capsules? A – To be effective, it takes a fair amount of creatine ethyl ester. To eliminate the adversity to taste, we have elected to put this creatine powder into a capsule. To keep you from having to swallow a couple of horse pills, we needed to use this number of capsules to make this supplement effective and at the same time, easy to use. Q – How do I know if Creatine Ethyl Ester is right for me? A – The proof is with trying it. Particularly if you don’t feel you are getting the benefit from our Creatine Monohydrate drink that you see others experiencing, you should consider switching. This form of creatine just might work better in YOUR body than other forms of creatine powders. TRY THE BEST CREATINE ETHYL ESTER FOR MAXIMUM MUSCLE GROWTH! Q – Do you need to be a bodybuilder to benefit from a creatine supplement? A – While bodybuilders are some of our biggest creatine fans, the best creatine advantage can be experienced by everyone. There are a number of healthy issues than can be diminished or completely eliminated with creatine supplementation. If you suffer from any of the ailments we have mentioned, ask your doctor of Creatine Ethyl Ester might be right for you. The information you find at ProteinCo Canada is NOT a substitute for medical advice. ALWAYS consult your doctor or pharmacist. Do not use any dietary supplement as a replacement for conventional care, or as a reason to postpone seeing a doctor about a medical problem. Tell all your health care providers about any complementary and alternative practices you use. Give them a full picture of what you do to manage your health. This will help ensure coordinated and safe care. 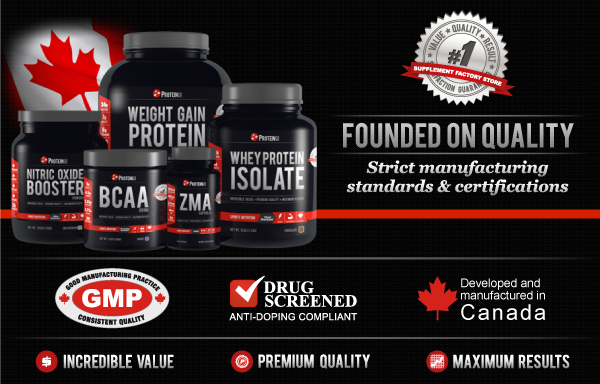 ProteinCo Canada is committed to bringing you Value, Quality and Results backed by our 40 Day Money Back Guarantee! Premium Quality - Strict manufacturing standards and certifications As with all ProteinCo Canada supplements, Creatine Ethyl Ester is manufactured under strict cGMP procedures to ensure the quality you deserve. This translates to peace of mind for you no matter what your reason is for wanting pure, healthy supplements. Maximum Results – Fast absorbing creatine supplement so you feel it NOW! Creatine powder is known to be a bit on the less than desirable taste scale. If you have issues with how our Creatine Monohydrate powdered drink tastes, you might want to switch to our Creatine Ethyl Ester. This supplement comes in an easy to use capsule form. Once the capsules desolves, you will benefit from IMMEDIATE creatine absorption into your system. You can’t experience maximum results from using our creatine supplements if you don’t take the product. Offering Creatine Ethyl Ester as a capsule supplement is just one more advantage this capsule has over creatine monohydrate powder. Hydratation With creatine in particular, it’s important to stay properly hydrated. Drink plenty of water before, during and after your workout to make sure you stay properly hydrated. Daily Dosage A daily dose of up to 8 capsules is recommended for no more than 4 weeks at a time. Cycle off for one week before continuing. Another option is to use a higher dose of 10-12 capsules for a 5 day cycle, then maintaining with 4-6 capsules, which may increase your body’s available creatine stores. Pre Workout The benefits from supplementing with ProteinCo Canada’s Creatine Ethyl Ester are seen when it’s taken before your training sessions. If you workout early, take 4 capsules right after you wake up and then four more as far out from your workout start as you can. You may be able to take all 8 capsules at once if you get up and head right to the gym. If this is your routine, we suggest you try it with 5 capsules first and then work up to 8 just to make sure your body can handle this much creatine power at once. Regardless, this supplement will very likely be the best pre workout creatine you have ever experienced.